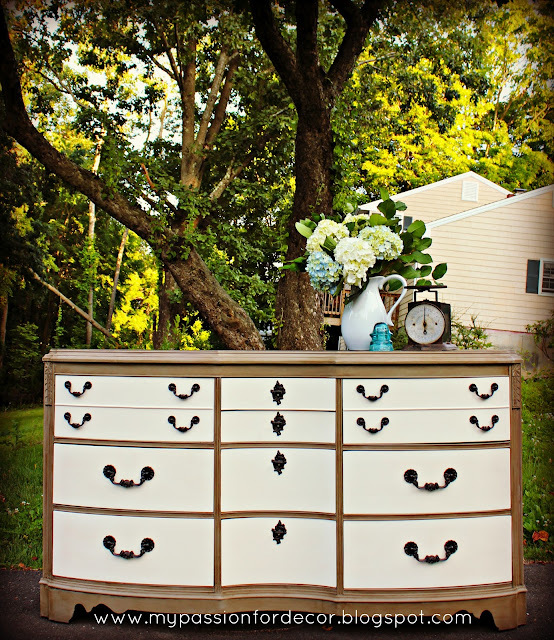 I wrote about a great dresser I found on Facebook a couple of weeks ago, the Cherry Blossom Dresser, and it's one of my all-time favorite pieces I've redone....until now! Surprising? Probably not because I think I say that every time I do a new piece. This time I'm serious though! 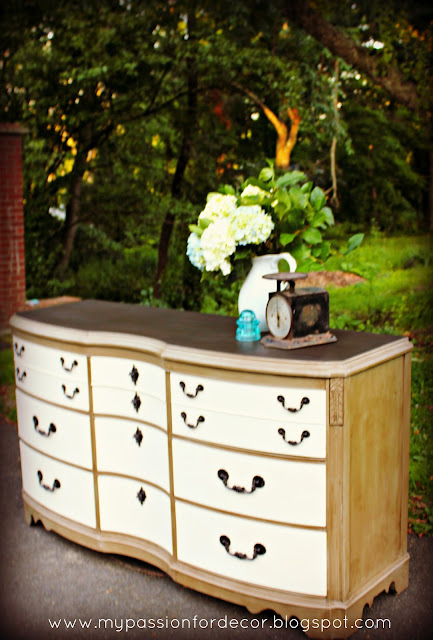 I found this great dresser on a Facebook tag sale a couple of weeks ago and couldn't wait to pick it up. The Hubby and I drove out and picked it up and well let's just say that two of us could hardly lift it into the car. It's solid mahogany and very well built and gorgeous. It had quite a few scratches on the top and it was a bit beat up, but I had a vision for what it would look like when I was done. It had the usual great lines, details and interesting hardware I look for in a piece of furniture. This is what it looked like when I got it home, well kind of! I did my usual get carried away and sanded the top down before I took a picture and I might have tested a bit of paint on the side too. Here it is in all it's shininess. I wish I would have taken a picture of the top before! Like it said it had some deep scratches that I wasn't sure were going to come out easily, but with a lot of sanding they went bye-bye! One of the things I liked most about this dresser were the many details. The way the dresser bows and curves in the middle, the flowers carved in both sides and the grooves that run along the dresser all made me smile. I didn't love the hardware, but knew that once I sprayed it with a coat of Oil Rubbed Bronze it would be just like new. The hardware is SOLID, heavy and again has a ton of character and neat detailing. 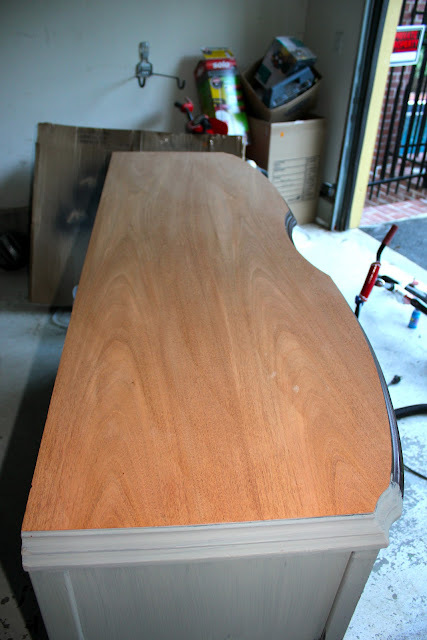 I had originally thought I would sand and stain the entire top, but then thought I'd rather do something a bit different and just sand the very top and stain that. 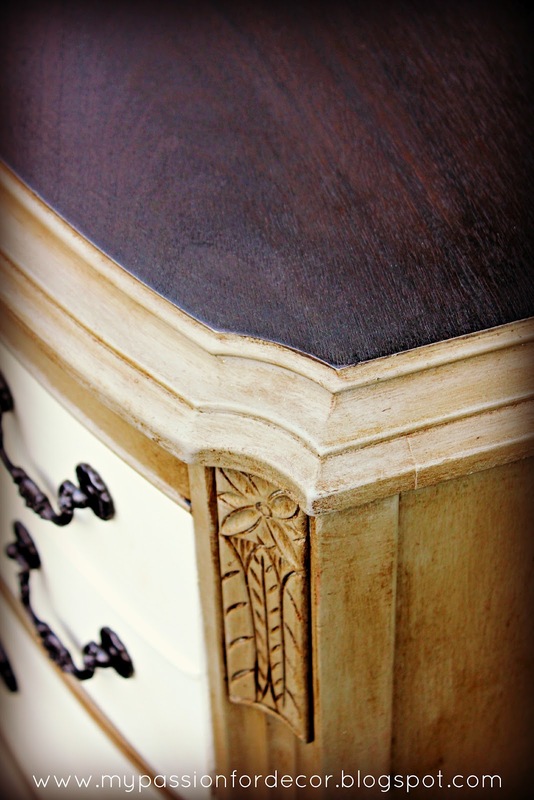 The top of this dresser worked perfectly for this treatment. I've really made an effort to do something a bit different with each piece of furniture I redo, whether it's the color or the paint treatment or the stain. I don't think anyone wants to see me do the same thing all the time. 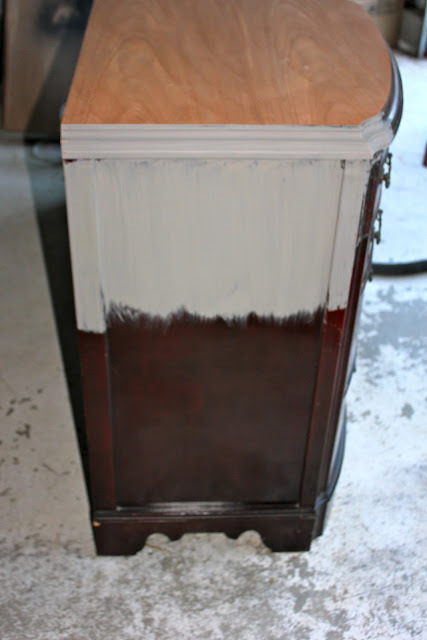 One of the best parts about using the Annie Sloan paint is her amazing choice of colors. There are still so many colors I haven't experimented with! I have two cans of brand new paint in fun colors that I have projects all lined up for! This is where I tested the paint on the dresser. I had just received an order of Annie Sloan and one of the colors I ordered was French Linen. It's a color I haven't tried before and I have to say I love it!!! Wait until you see how this color looks on the finished product! Here you can see a bit better what I was mentioning earlier. I only sanded the very tippy top of the dresser and painted the sides of the top. I love how it turned out! I decided to stain the top in Ebony. This is how it looked with the top stained and 2 coats of French Linen. I didn't want to do the drawers the same color because that would be too boring, right?! 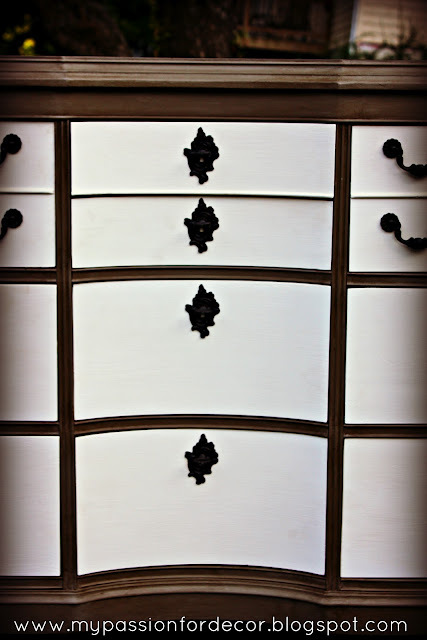 I did the drawers in my favorite Old White. I have to make a quick point here....Mahogany is a real pain to paint! I primed the drawers with Kilz and still had to paint 4 coats of the Old White on top of that to prevent the stain from bleeding through. The French Linen was better because it's darker, but there were parts where it still wanted to bleed through. I'm not so sure I want to do another mahogany piece again for awhile. I finished it all off with a coat of clear wax. The top I put on a coat of dark wax to protect the top and also dark waxed the body of the dresser. I decided to just use clear wax on the drawers to make them pop and WOW do they pop!!!!!! Here it is all finished and I really, really, really, really (did I write really enough?) LOVE this one!!! 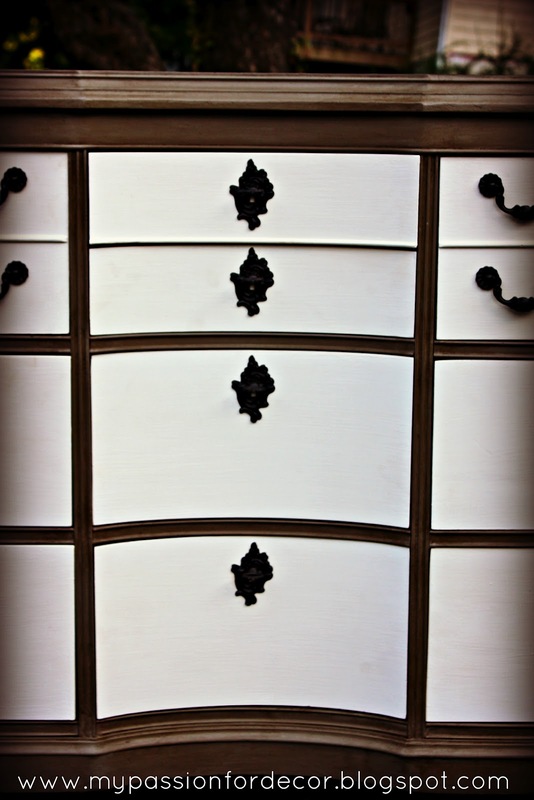 I love how the hardware pops off the Off White drawers and the drawers pop off the body of the dresser! The dark wax looks amazing on the French Linen. It really darkens and deepens the color. I love how the carved flower looks now. 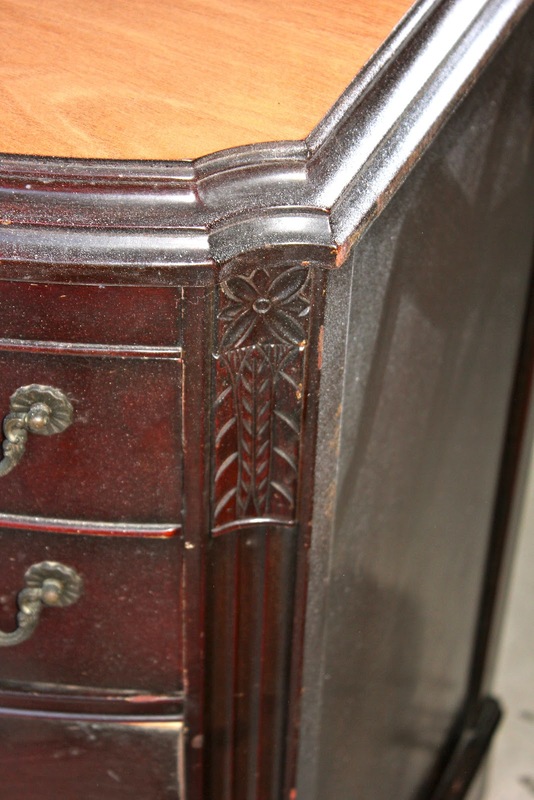 When you put dark wax on top of details in the dresser all those details really show up nicely. Then there's the top! WOW, it looks incredible, no?? The one thing that makes redoing furniture the most rewarding is starting with an idea in my mind and then having it far exceed my vision. It's so much fun to take something that was nice to begin with and make it completely unique and special. I don't think you're going to walk into another home and find a piece just like this one. I like how the dresser has the curves along the bottom it adds so much character. I'm very glad I didn't stain all the way down and only did the very top. 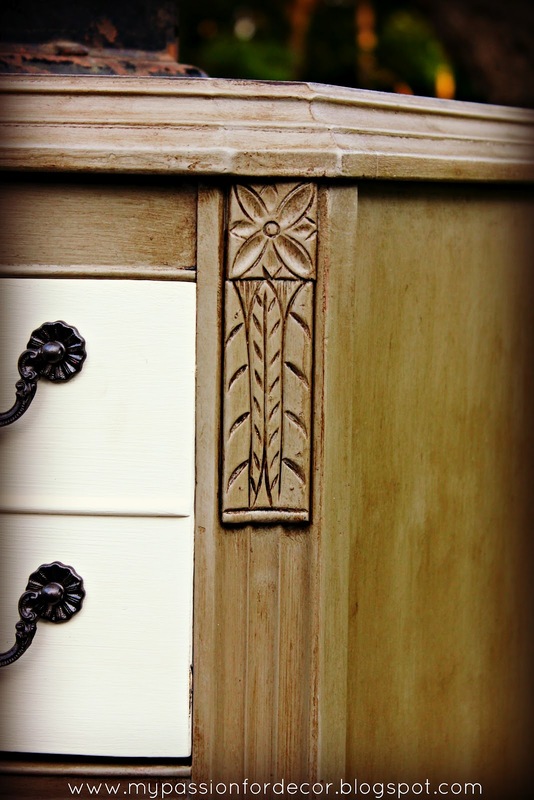 One of the other things I loved about this dresser was the hardware on the middle section. They look like little keys in key holes when you look up close. I didn't get a good enough picture of them up close. When I'm working on a piece of furniture I'm always excited about the outcome, but this time was a bit different. A few times today I called the Hubby in to have a look. I kept saying, "Can you believe how great this looks?!" He was sweet enough to agree with me of course. Then when I was finished I called him back out again and we both stood there staring at how pretty it was. I said my usual thing, "I love this so much I need to keep it!" He kindly reminded me that we have NO room for yet another dresser unless I planned on getting rid of something. I then asked him if he might like to trade his dresser that I recently refinished for this one. He said, "NO." Of course I knew he was right. This one is special, but it will have to find a new home. Now the search begins to find this beauty a new place to live. 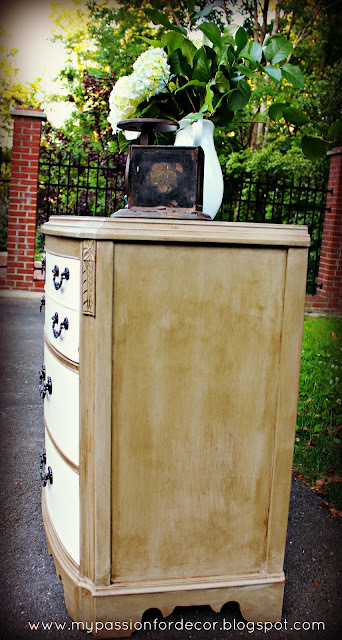 What a find and the transformation is utterly gorgeous!! Wow, your dresser looks amazing!! The drawers really pop with the white. You did a FANTASTIC job! 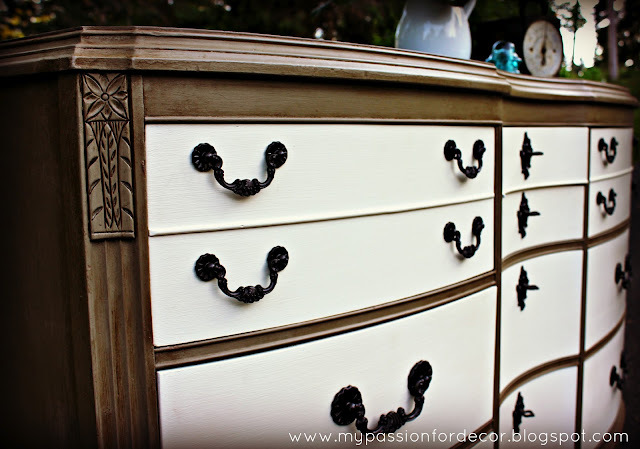 I love how you can make old furniture look new then old again! Talk about breathing new life into a classic! Well done! Yey!!! It did find a new home that will love it so so much! 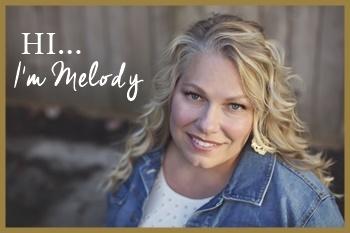 Thank you Melody - I can't wait to showcase your work in my new home. wow- what a find that dresser was! it's stunning! love the new look! What a great contrast with the cream & wood... 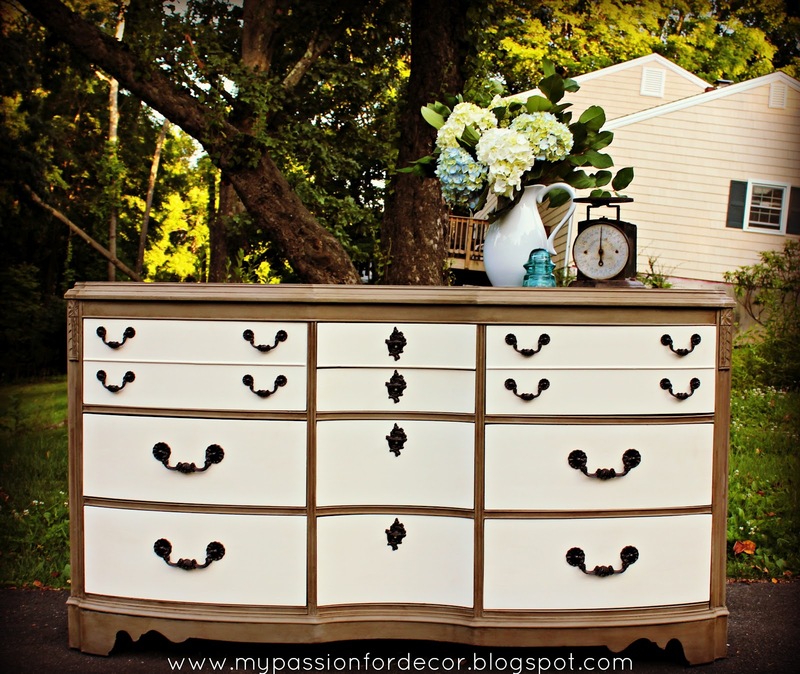 I would have never thought to paint a dresser that way! This is beautiful, so elegant looking, very nice work. Oh my! I am SO glad I found your blog! I was popping on over to say thanks for linking up your green beauty to TA-DA TUESDAY becuase your are being featured, and BAM! Here was this beauty! You are amazing! I'd love fo your to link her up to the current TA-DA TUESDAY! I look forward to the next piece! Can't wait! Looks great! I had a similar one last fall and it.was.heavy! It is so pretty. lOve the color combo and the jewelry too! Melody, you are right...it is a keeper. The dark wax really made the paint color richer and the two tone look does this piece up right! Great job all the way to getting your husband to help you photograph it. Determination! It pays off. I found this post at At The Picket Fence. Hope you'll stop over for a visit at my place sometime soon. Gorgeous. You have to keep this one! I'm going to pin it. 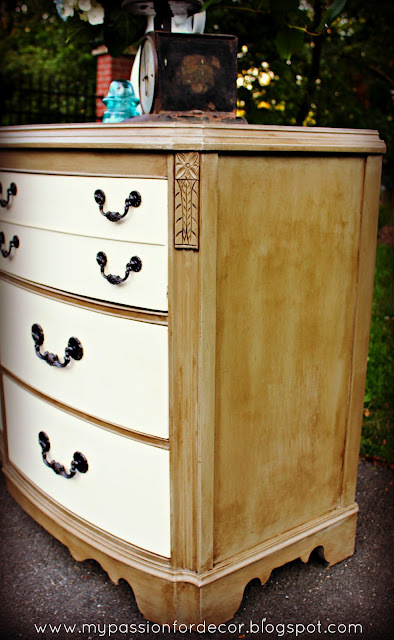 I love the wood stain and the combination of paint colors. Lovely! Absolutely stunning! You did a magnificent job with this redo. It's beautiful!! Thanks so much for linking up at Feathered Nest Friday! Just beautiful! I am about to paint my bedroom furniture and I can't decide whether to use French Linen or Old Ochre. I love how yours turned out! I am now following! Thanks so much for linking up to TA-DA TUESDAY! <3 this so much, I'm speechless! If you haven’t already, I’d be delighted if you’d follow back : ) blessings! What a beautiful job Melody! You would never know that is the same piece. Just stunning. Thanks for sharing with the newbie party. You're sooo right! That color is PERFECT!!! You ordered the paint online? I may need to check if they ship to Canada! 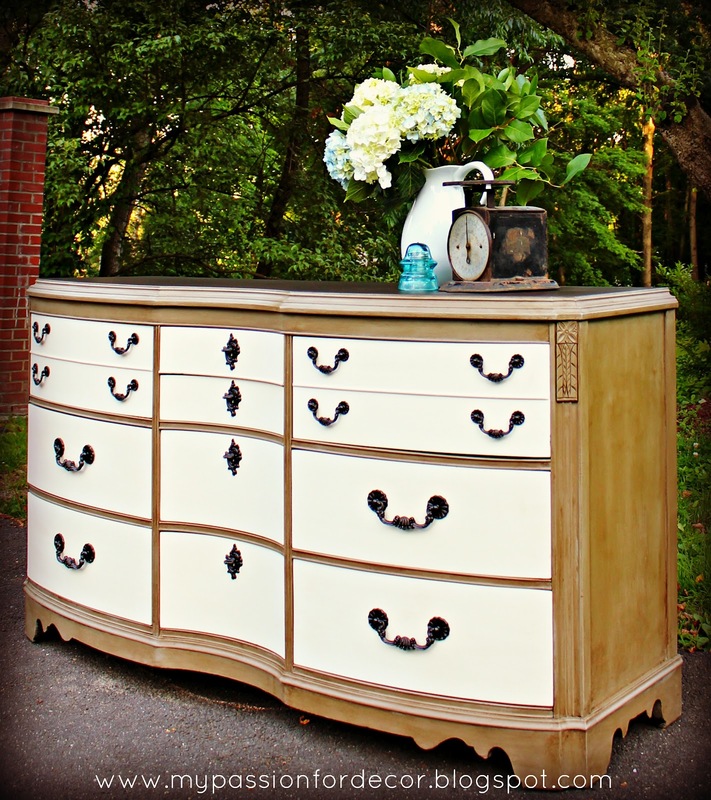 Gorgeous dresser! I love your color choices too! Wow! Gorgeous!! I love this dresser. OOOOOOO baby! Wow! Lovin this! Wow! What a beautiful find and an even better transformation! We would love to have you link up over at our party. Thank you! I linked up and am now following you. Beautiful! Color choices are amazing. Lady. You are a bundle of talent! 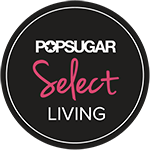 So excited to see you featured over at Miss Mustard Seed. Congrats!! Wish you had a fb page so I cold catch up easier. (hint hint) If you decide on one. Give me a shout. I would be happy to introduce you around. Visiting from MMS. It is beautiful! Very creative and unique! It's hard to part with such beautiful pieces but you will have no problem finding it a deserving home. I love this piece!!! Well done! I just saw this and I wanted to take a moment to tell you that this piece is exquisite. What an amazing job. You are incredible! I have recently become somewhat obsessed with refinishing furniture when a friend of mine sent me your link. Inspiring. Keep going please!! Wow, thank you!! :-) Also, thank you to your friend for sending my link to you! 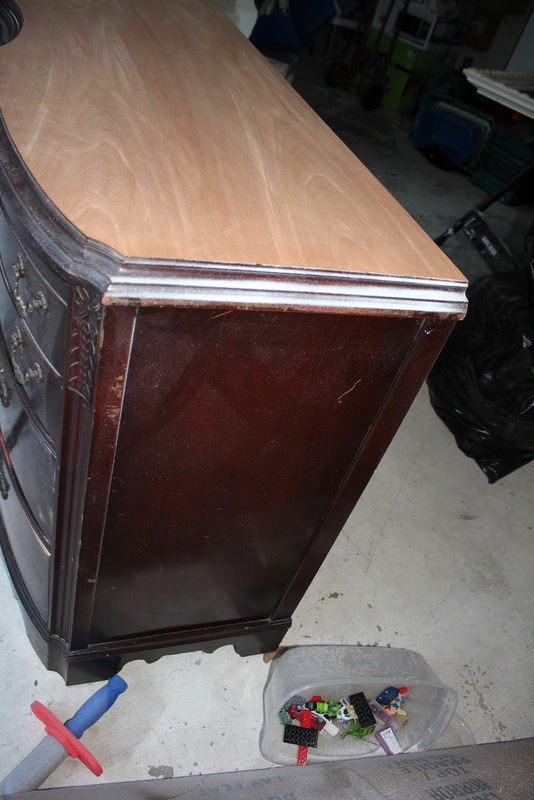 1. did you sand the drawer fronts and side of dresser? 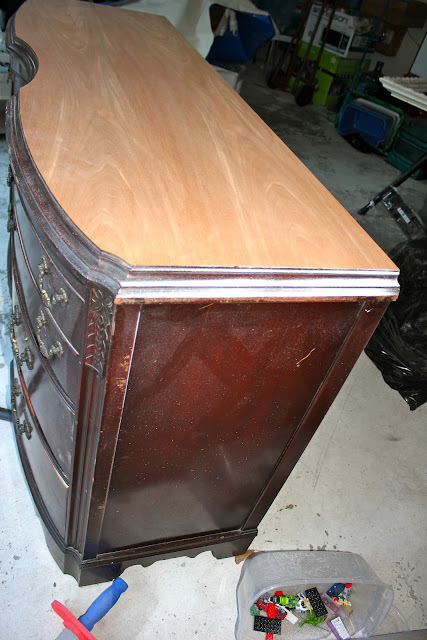 2. did you clear wax the entire dresser then add the dark wax? and how do you get that effect with the dark wax? do you just rub it on? or do you wipe off excess? i have never used it before but am SOOOO eager to learn how! !